The Memory Hole hosts a gallery of photographs taken from inside the U.S. Embassy during the crisis. "Learning to Keep a Secret"
^ Mark Edmond Clark, An Analysis of the Role of the Iranian Diaspora in the Financial Support System of the Mujahedin-e-Khalq, (编) David Gold, Terrornomics, Routledge: 66–67, 2016, ISBN 1317045904, Following the seizure of the US embassy in Tehran, the MEK participated physically at the site by assisting in defending it from attack. The MEK also offered strong political support for the hostage-taking action. ^ James Buchan. 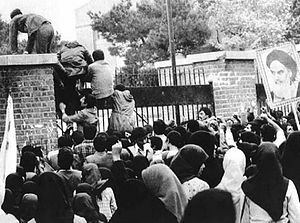 Days of God: The Revolution in Iran and Its Consequences. Simon and Schuster. 2013: 257. ISBN 1416597778.